The bizarre and gratuitously violent, soon-to-be-cult movie that is Snowpiercer is in a long tradition of film and fiction writing that casts radical judgment on its audience. The teenage cult sensation The Hunger Games sits in powerful company with Snowpiercer. Both Snowpiercer and The Hunger Games are stories of class conflict; about cheering for the underdog. However, the jarring reality that most viewers dare not face is that in real life we, the viewers, are not on the side of the underdog heroines and heroes; we are the enemy. In Snowpiercer, a film where the last vestiges of humanity are all travelling together on a huge, high tech train, the carriages appear to represent the current geographical distribution of the world’s people. The poor are contained within their grimy ramshackle carriages at the back of the train by armed border guards and sophisticated locked doors whereas the elite may move up and down the train at will. The wealthy can pop into the poor carriages and pluck out people who fit some need that they have, while leaving the rest in squalor. The parallels with the relationship between rich countries and poor countries are unmistakable. This relationship is something that most of us shy away from. I’m no exception. I just sat watching the second Hunger Games film in a comfortable heated room with a glass of expensive whisky by my side. I was curious to see what all the fuss was about. As it turns out, it was about me and my expensive whisky. We sit here entwined in our socially fabricated struggles with justifications galore about why we are doing it tough. Real estate prices create mortgages that vacuum our apparent opulence away. Still, we have the luxury to sit back on a Friday or Saturday night, have a good meal and watch a film. Who could begrudge us that after a hard week? How can any of what we have be morally reconciled with the life of serious abject poverty or profound physical insecurity that so many in the world face? Most of the time this is too much to contemplate so we choose not to really engage. While being entertained we can experience truth that we otherwise couldn’t relate to. Both The Hunger Games and Snowpiercer have us identify with protagonists who, if we were in their world, would consider us the enemy. It’s a class struggle and we (almost anyone in the western world) are the powerful and wealthy elite. The bourgeoisie. Our opulent consumption is at the cost of their survival or, at the very least, their dignity as human beings. 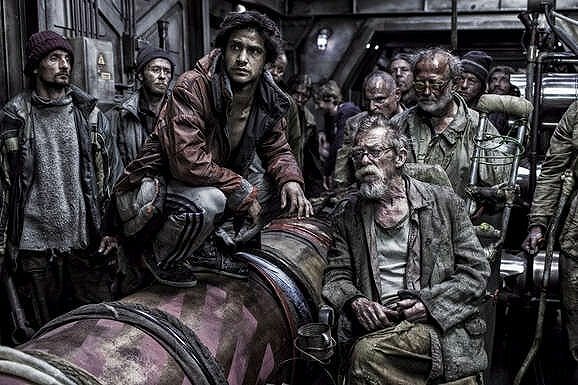 For a couple of hours, when we watch Snowpiercer, we identify with the Afghan refugee, walking, wide-eyed through the opulence of a western city. For a couple of hours, we are the slave, mining coltan in the Congo for smart phones and computers. Few come out of the cinema owning that experience but, like the beginnings of all powerful change, the effect is in the margins. As a society, we’re so determined not to have our opulence interrupted by those from another class (i.e. from a poor country) that we endorse the maintenance of heavily armed borders and inhumane policies to punish any who try to come here to live without our invitation or permission. What’s to be done? Do we take the red pill or the blue pill? If you’ve somehow dodged that Matrix reference I’ll spell it out for you: you can either forget what’s written here and wake up tomorrow as normal, in your soft and comfy bed, or you can digest what’s here and the implications and do something. Do you want to be the indoctrinating school teacher in Snowpiercer? Do you want to be one of the adoring fans in The Hunger Games, cheering while poor people kill each other? Is that something you can consciously accept? The writers and directors of these films and books are telling us something and it’s about more than cheering for the underdog. While we are watching these films we’re cheering against ourselves. After you acknowledge that’s what you’re doing you can never quite go back to how you were, even if you do take the blue pill. Warwick Smith is an economist, philosopher and social commentator. He blogs at reconstructingeconomics.com and tweets @RecoEco. This entry was posted in climate change, Inequality, movie review, Political philosophy and tagged asylum seekers, class, immigration, snowpiercer. Bookmark the permalink. Tricky to tease out which parts of our wealth we create and which parts are effectively stolen from those at the back of the train. How dependent are are we on cheap foreign labour? Are we really the modern equivalent of the British East India Company? Surely wealth is not a “no sum gain” ? After all , corruption distorts markets into less efficient forms, so won’t fairness and equality lead to much greater overall wealth? Yes, there’s now lots of data showing that high levels of inequality are bad for overall economic prosperity. We have mobile capital and immobile labour which allows capital to exploit labour – an imbalance that isn’t in any economic text book. I’ll check out the film.